The Ohanaeze Ndigbo, on Friday, warned of dire consequences over the bench warrant issued against Mazi Nnamdi Kanu, leader of the indigenous People of Biafra, IPOB, by a Federal High Court in Abuja. Justice Binta Nyako issued the order following Kanu’s continuous absence from court. 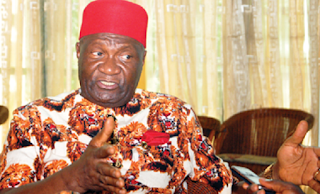 But reacting through a statement signed by Mazi Okechukwu Isiguzoro, President General, Ohanaeze Ndigbo Youth Council Worldwide and Mazi Okwu Nnabuike, Secretary General, the apex Igbo organization said such order would spell doom. They, however, urged the IPOB to “resist any temptation of allowing Nnamdi Kanu to return to Nigeria, as the healing process of those slaughtered during the first arrest and python Dance has not been completed. “There’s no need to escalate the tension already established in the Southeast over the menace of herdsmen ravaging some parts of igbo land; there’s no need to compound our loss by allowing Nnamdi Kanu return now until Igbo Christian and Traditional leaders intervene in the process. “We are pleading With President Buhari as the father of the Nation to grant Presidential Pardon to Mazi Nnamdi Kanu, as a way to show compassion to Ndigbo. We are aware of the Presidential release of over 500 inmates of suspected Boko Haram detainees in Kano Prisons. “Presidential Pardon to all Biafra agitators, including Nnamdi Kanu will save a lot of Billions of Naira that would’ve been used for peacekeeping, in the imminent collapse of peace and civil disturbances that will follow immediately if he’s re-arrested.